A dairy-free and egg-free recipe for rich, creamy vegan scalloped potatoes, with green chilies for a bit of a kick and nutritional yeast for a cheesy flavor, this is a healthier, cholesterol-free and reduced-fat version of a classic American side dish. If you like scalloped potatoes, this vegan version with green chilies and a cheese-like nutritional yeast sauce won't disappoint. 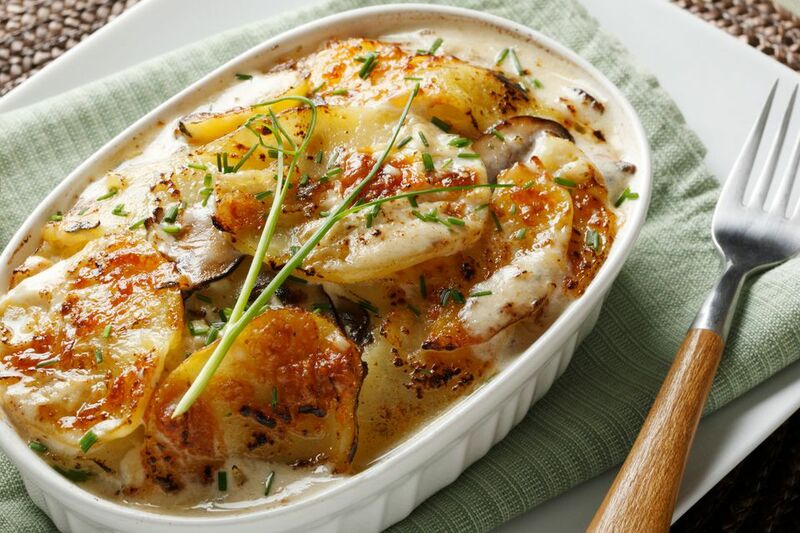 Lightly grease a casserole baking dish and spread the sliced potatoes in the dish. In a medium saucepan, whisk together the flour and vegan margarine over low heat until margarine is melted and combined with the flour. Add the boiling water, soy sauce, garlic, and onion powder and turmeric, stirring briskly for a few minutes, until sauce has thickened. Whisk in the oil and nutritional yeast, stirring until smooth, then stir in the chilies. Pour this sauce over the potatoes and gently stir to combine and coat the potatoes well. Sprinkle with a generous dash of salt and pepper, and paprika, if desired. Cover with foil or lid and bake for 30 minutes, then remove foil or lid and bake uncovered for 30 more minutes, until the top layer of potatoes is golden brown. Sprinkle with additional salt, pepper, and paprika before serving, if desired. Vegans Love This Egg-Free Potato and Carrot Kugel Recipe!